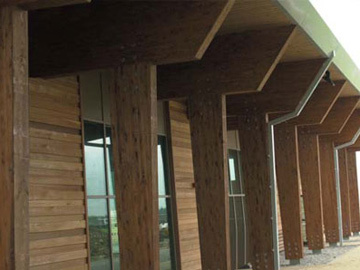 If you need cladding for a new or old building you could do a lot worse than using cedar cladding, it is beautiful to look at, durable, easy to maintain and not difficult to install. However, you do need to buy good quality cedar cladding to get the most out of this material. Buying cladding made from cheap knotty, fast grown, poorly conditioned cedar is a false economy. Only buy slow grown, sustainable cedar cladding from well established companies. Look for companies who have good customer testimonials and are members of trade organisations like the Timber Trade Association. Speak to the supplier before buying, so if you are buying online only use those companies who include a phone number. Look for a company who offers installation advice. A phone number and/or installation advice is a good indication that the company is genuinely interested and supportive of their customers, something that is crucial when spending so much money. Installing cedar cladding is something you can do yourself, but if you have never done it before it pays to use a professional carpenter. Some carpenters are happy to work with you for a few days and show you how it is done, so you can finish the job off yourself. They will charge a bit more for their labour, but do not be put off because, after all, they are actually training you too. Timber Cladding sells good quality cedar cladding as well as what you need to give you a clean, crisp finish.